Finding Comedy in the Overwhelming Futility of Life. David Bonanno as Vanya with Deonna Bouye as Cassandra. Photo by Hubert Schriebl. Brandon Drea as Spike with Haley Bond as Nina. Photo by Hubert Schriebl. Susan Haefner as Masha, David Bonanno as Vanya, and Amelia White as Sonia. Photo by Hubert Schriebl. Cast: Vanya (David Bonanno), Sonia (Amelia White), Cassandra (Deonna Bouye), Masha (Susan Haefner), Spike (Brandon Drea), Nina (Haley Bond). Set: Howard C. Jones; Lighting: Ann G. Wrightson; Costumes: Kirche Leigh Zeile; Sound Design and Original Music: Rob Milburn & Michael Bodeen; Production Stage Manager: Lloyd Davis, Jr.
At the Weston Playhouse Theatre Company, Weston, Vermont July 17–July 26, 2014. www.westonplayhouse.org. 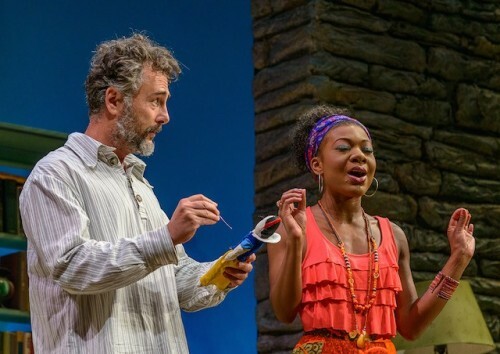 Though a broad comedy, cleverly written to the American taste, Vanya and Sonia and Masha and Spike by Christopher Durang, as its name hints, takes much of its structure and its underlying theme from the plays of Anton Chekov. The laughs, and there are many in this entertaining production, spring from the very aimlessness and futility of the lives of these characters. Several members of a family, two sisters and a brother, all in their fifties, are spending a couple of days together in the family home, which is set in the country. Neither Vanya nor Sonia, who was adopted, ever left home or married. Together they cared for their elderly parents, while Masha became a successful actress in popular but insubstantial and forgettable movies, traveled the world, had five failed marriages, and paid all the family bills, including stipends for her brother and sister. This weekend Masha has arrived with her current vacuous boy toy, Spike, and an invitation to a neighbor’s costume party. Cassandra, the hilarious, prophetic cleaning lady, played with nimble grace by Deonna Bouye, enhances the action and the mood with long and enigmatic sibylline pronouncements. Spike befriends Nina, an innocent and pretty young neighbor, lightly introducing the clash between older and younger generations as the promise of these young people’s future contrasts with the disillusionments of the middle age siblings. The first act of the play introduces the characters, their history and the strengths and resentments of their relationships, with the siblings all mired in what they see as the pointlessness of their lives. It also introduces the main conflict, Masha’s intention, now that the parents are gone, to cut her expenses by selling the family home. The second act takes place after the costume party, which has shifted the perspectives of the characters and suggests a path forward to a new and wholly unexpected future. Director Steve Stettler’s production is light, crisp, and funny. David Bonanno’s straight-man comic timing as Vanya plays very well with Amelia White’s engaging and bombastic Sonia. Susan Haefner’s Masha is appropriately self-absorbed and overbearing, contrasting with the simple innocence of Haley Bond’s Nina. Brandon Drea’s Spike, though attractive, is a bit over the top in his gyrations and sexual come-ons. The simple effective set, by Howard C. Jones, which suggests doorways and entries with free-standing frames, uses full-sized trees and an expanse of clouds and sky in the background to establish a beautiful country setting. The gorgeous colorful lighting by Ann G. Wrightson sets the mood and marks the passage of time. The costumes, by Kirche Leigh Zeile perfectly establish characters and their moods including signaling and, in some cases, triggering their shifts of perspective. The references to Chekov’s works add an interesting and playful dimension to Vanya and Sonia and Masha and Spike, but are not necessary for full enjoyment of a delightful evening with this off-beat family haltingly navigating the same uncharted shoals that all of us must traverse in our middle years. As with all comedies at the Weston, this show has a short run. Take the time to see it before it closes on July 26, and while you’re at it, make reservations to see the Weston’s August production of Annie Baker’s new translation of Chekov’s Uncle Vanya, which will be set in contemporary Vermont.